My first video game console was a Sega Genesis, purchased secondhand near the end of the console’s lifecycle. I remember first playing Sonic the Hedgehog and struggling to get through level one. I remember the weight and size of those first controllers, struggling to get my young fingers around all three of the buttons. I remember my mother managing to get to level three of Green Hill Zone, and I remember running away in fear from Dr. Robotnik’s first appearance. I remember playing The Lion King. If you’re not a video gamer from the early 90s, then it’s likely that you only know video games based on films as cheap cash-ins designed solely around squeezing a few bucks from uninformed consumers. That was certainly still the case in the 90s as well, as there were plenty of cheap cash-in games, and one only need to look at Angry Video Game Nerd or similar to see these atrocities. But some games had honest-to-god effort put into them, and while the results weren’t always instant-classics, they were often playable and fun games. The Lion King is one such effort. And it’s also hair-rippingly hard. Wait, you have to land on their heads? But just last weekend, I was able to finally cross a goal off my video game bucket list. I beat The Lion King. Which means I can now review it. I don’t think I’ve ever been so happy. 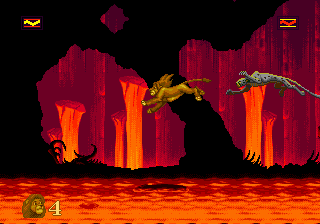 The Lion King is a 2D platformer with ten levels, six of which you control young Simba, and the remaining four you control adult Simba. The levels are loosely based on events from the film, covering things like the Stampede and Simba’s chase of Rafeki through the woods. My favorite part of the movie was the lava pits. Young Simba can do a few things. He can run and jump. Landing on enemies serves as an attack, and he can roll. Pressing the A button makes him do an adorable roar, with varying strengths depending on the meter on the top left corner of the screen. His health is on the top right, and can be restored (and strengthened) by eating collecting bugs in the levels. Adult Simba gains a scratch attack with the B button, and can no longer roll. It sounds simple, and it is. But Derek, you say, you said the game was hard. The Lion King was released at a time when games for children did not baby them. There was no unlimited lives, unlimited continues, or anything so kind. Instead, you get sharp platforming and unforgiving enemy attacks. Everything in this game is trying to kill you, and will happily do so if you don’t kill it first. You have porcupines that you need to flip over by roaring at or rolling into, you have hyenas that stalk you endlessly. And you have jumps. Terrifyingly precise jumps. And the stampede. Because of course there’s a level based on that. As a child, getting to level two was an accomplishment. Getting past level two was worthy of song and dance. Take a look at level two and tell me you could do this at five years old. I was determined though. I kept playing this game, and got better. It seemed that every time I played, I got better at the game, and eventually could past levels like the Elephant Graveyard, Hakuna Matata, and so on. Eventually, I could get to the final level, where Scar and Simba had their ultimate showdown. I could just never beat Scar. I had the original cartridge, sold it to Gamestop (like a moron), and played the game occasionally on emulator. This game grew to haunt me, becoming something that I could never beat no matter how hard I tried. Recently, however, I’ve been trying to rebuild my Genesis collection. I found a used games store/comic book shop near my house, and went there with a friend over the weekend. For five dollars, they sold me The Lion King cartridge. On a whim, I popped it into my Sega Genesis and tried to beat Scar. On the way, I realized something knew. Simba could throw enemies. I had to slide my fingers between the B and C buttons to do it, and it was inconsistent (whether that was the game’s fault or my controller remains to be seen), but it could happen. I knew I had to throw Scar off the ledge, and I finally figured out how to do it. I got through the game, swearing my head off on the way for each missed jump. I clawed my way through the horror of Can’t Wait to be King, destroyed the gorilla from Hakuna Matata and even dodged lava on my way to Scar. Scar is a prick. You have to fight him three times. Each time, he plays with you for a little while, before sticking his nose in the air and jumping away. I chased after him, my new knowledge ready. Finally, I climbed to the top of the cliff, and we faced off. He tried to claw my face off. I threw him off the ledge. I screamed, my voice echoing through my house. Finally, I had done it! I had beaten Scar! The game that I spent close to 20 years of my life struggling through was finally complete! I saw the ending (it was disappointing, as expected) and I finished it! I did it! Whoo! The Lion King is not a bad game, far from it. The platforming may be irritatingly precise, and some puzzles feel very vague, but it’s a functional, if frustrating game. You have all the tools to get through it, the game just doesn’t hold your hand on the way. The graphics are fantastic, as is the music, even now. Plus, you can throw Scar off a cliff. Next up? Sonic Spinball. Bring it on. Frame rates: Big deal or a thing to wave in others’ faces?